The term geode is derived from the Greek word for “Earthlike” and refers to a hollow rock with a crystal-lined cavity. These rocks may range in size from a few centimeters to several meters in diameter, and they come in many different shapes including spheres, ovals, oblong blobs, and irregular masses. 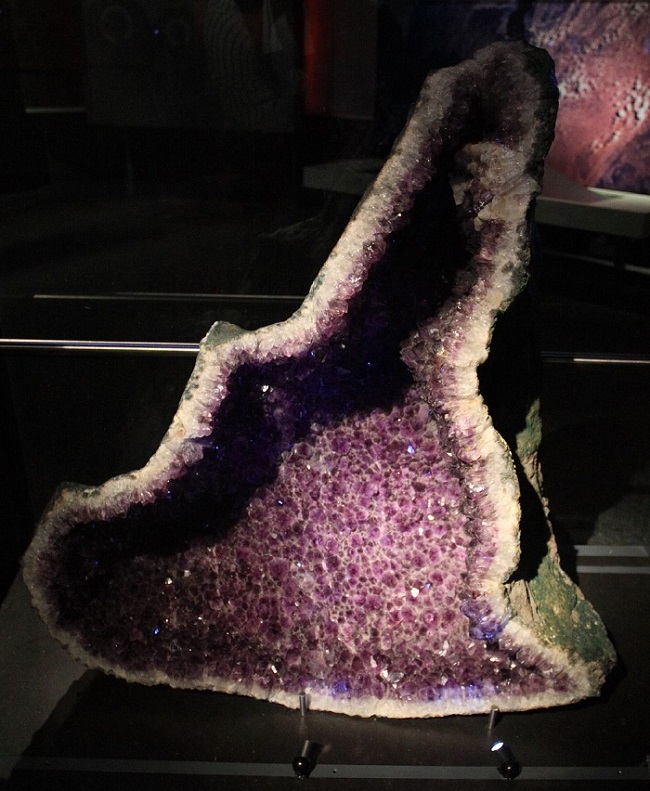 As an example, the geode pictured below is lined with amethyst crystals and exhibits an irregular shape. Geodes form in a multi-step process. The first step involves the creation of a cavity in rock. This may occur, for example, when lava cools; lava can “leak” out of a hardened shell and leave a void space, or dissolved gases may leave pores behind in the rock. Cavities may also form in sedimentary rocks when a section of rock dissolves and leaves behind a void space. Osmosis may also play a part in forming cavities as water seeps into and expands saline cavities to equalize osmotic pressure. After the cavity forms, mineral-laden water will slowly seep into the void space and deposit its minerals as crystals. This process may take thousands or millions of years. If the crystals continue to form to the point of completely filling the void space, then the “geode” will become solid and be called a nodule instead. The minerals deposited within a geode depend heavily upon several factors including the location where the geode was formed, ground and water chemistry, and the type of rock surrounding the geode. As a result, geodes from different regions often have different minerals within them. Because a geode is defined as a hollow rock lined with crystals, geodes vary not in their structure but rather in the type or types of crystals found within their cavities. Common crystals include quartz, agate, jasper, gypsum, chalcedony, hematite, dolomite, calcite, and many others. 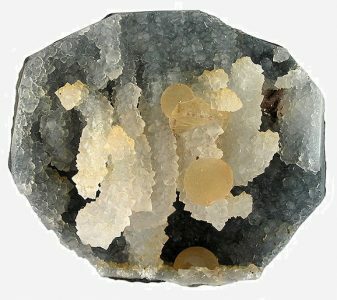 (Some unusual geodes may even contain petroleum!) Multiple types of minerals may form within a single geode, and the crystals may form in distinct layers or shapes, which can produce beautiful patterns and structures. This interesting geode, for example, contains strange calcite and fluorite structures. Perhaps the easiest (and only) way to positively identify a geode is to crack it open and look for the hollow interior. If you are unable to crack open a potential geode, however, then there are several tricks to identifying potential geodes. Because they have a hollow cavity, geodes are often lighter than solid rocks of the same size and shape. They may also have loose crystals inside, which will cause them to rattle when shaken. Geodes are also often round or roundish, and their surface frequently has a distinct texture that distinguishes it from surrounding rocks; see the image below. There are several different methods of cracking open geodes. The simplest method involves placing the geode in a cloth bag, sock, or another flexible, tough container and striking it with a hammer. This method works for smaller geodes, but it may break the geode into more pieces than desired! Geodes may also be cracked open using a special device called a geode splitter or cracker. This tool consists of two wedges placed opposite one another and a pneumatic press that forces the wedges together. To split a geode with this device, the user adjusts the wedges so that they hold the geode snugly between them, and he then pumps the pneumatic press until the geode splits. Still other methods involve cutting geodes in half with rock saws or splitting them with tension from a metal chain. If you would like to use one of these methods to split open geodes but do not have the equipment, then try contacting your local rockhound club or geology department. Needless to say, when splitting geodes, it is always important to stay safe: wear safety glasses and gloves, and make sure to keep your fingers away from moving parts or pinch points. If you are a child, then seek adult supervision as well. After splitting geodes, some users may wish to polish the geode faces. This requires special sandpaper and requires lots of time and patience. Machine sanders may be used to expedite the process. Geodes occur around the world, and they are often found in or near limestone beds or igneous rock deposits. Brazil is well-known for its geodes, and many of the states in the United States have excellent sites for hunting geodes including Iowa, Illinois, Indiana, Kentucky, Utah, California, Arizona, and Nevada. Geodes are commonly sold at museum gift shops, rock shops, and other places that sell trinkets. They make excellent gifts for both rockhounds and non-rockhounds alike due to their pretty crystals, and geodes commonly find themselves serving as paperweights, suncatchers, bookends, and other ornaments. Geodes are an excellent way to excite people, especially children, about geology, rocks, and minerals. Splitting geodes is a lot of fun, and many companies sell geodes for precisely this purpose. 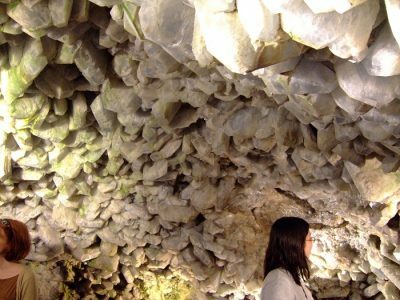 Crystal Cave on Put-In-Bay Island in Lake Erie (Ohio, USA) is the largest geode in the world. Owned by Heineman’s Winery, it makes for a popular tourist attraction on the island. It’s large enough that visitors can walk around inside it like in the photo below. 1. Which type of rock are geodes not usually associated with? 2. What is the difference between a geode and a nodule? A. Nodules and geodes contain different types of minerals from one another. B. A geode starts as a nodule but becomes a geode as the crystals within it grow large enough. C. Nodules are only found in North America, but geodes are found worldwide. 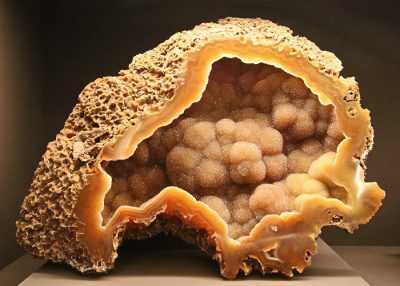 D. A nodule is a geode that completely filled with crystals and lost its void space. 3. Why do crystals form on the inside of a geode? A. As lava or magma cools, it creates crystals that form on the inside of void spaces formed from gas bubbles. B. Crystals form because mineral-laden water flows into a void space and deposits the minerals on the sides as crystals. C. Chemical reactions between groundwater and surrounding rock precipitate out crystals. D. Gases in the void space slowly precipitate out crystals. 4. Which of the following is not a common method for splitting geodes?